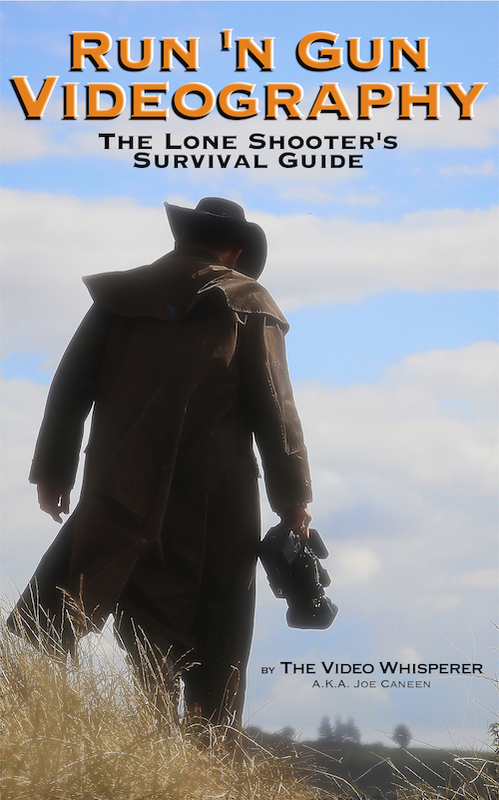 I’ve decided to write an ebook expanding a lot on the sorts of things I post on this blog periodically. Incidentally, the Video Whisperer blog was originally borne out of a desire to help new-comers to video production to understand some of the fundamental basics of the subject they might otherwise never have learned in film school or otherwise. Apparently quite a few folks out there have found the information useful and some have urged me to write a book. Since I like to write, that invitation was all I needed (in addition to a little extra time to do it). I wrote the first 5 thousand words at Heathrow a couple weeks ago, and a few thousand more in the odd late hour since then. I thought I’d share the introduction to the book to test the waters. If you’ve ever wondered where the name “Video Whisperer” came from, here is that story. After spending most of my life working as a cameraman and director (both film and video) for a studio within a team setting, I decided to go solo as a video producer in 2008. My wife Laury and I were living in Montana and my talented step-daughter Chloe was visiting us from England over the Christmas holiday. As Chloe was an aspiring singer/songwriter, we decided to check the local classifieds for a free piano that we could lug home before Chloe arrived. We found one in nearby Idaho, and set off across the mountains and fetched it home (a little Montana lingo there). Within a few days of her arrival, Chloe had already written a new song…and I had an idea. We dragged the old upright piano back out of the house, onto the trailer bed and parked the whole thing in the front yard (in the middle of ten acres of wilderness). We were due for a big snow storm that night so I instructed everyone to gather up some pine boughs from the surrounding forest of trees and place them around the wheel wells and hitch of the trailer. Then we draped some heavy-duty plastic over the trailer bed and anchored the ends in the existing snow to create a sloped surface from the edge of the flat trailer bed. Finally, we tarped the piano and called it a night. The next day we awoke to 8 inches of fallen snow. The trailer was completely hidden under a thick blanket of snow. The piano appeared to be sitting on a small treed mound outside in the Montana wilderness. 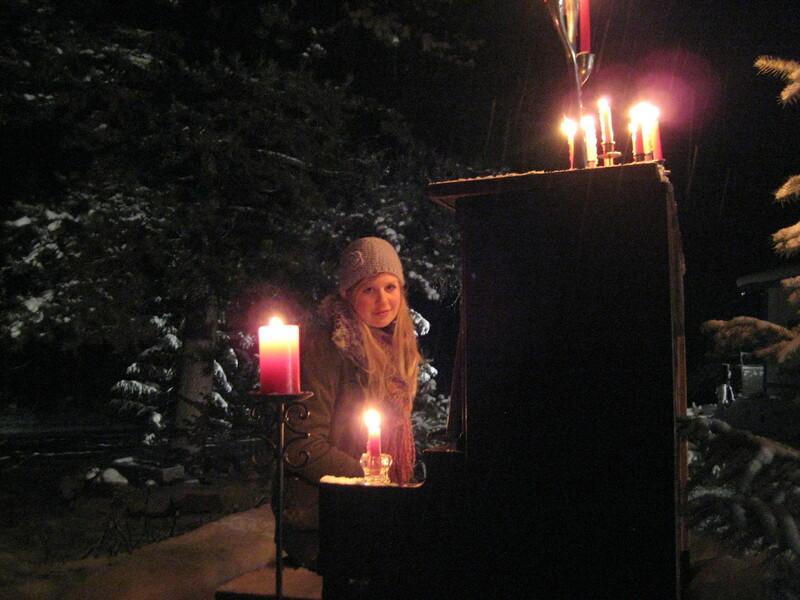 That day Chloe bundled up and rehearsed the song at the piano under sunny blue skies in the crisp, dry sub-zero temperatures of our Montana Winter wonderland. As usual and expected, some of the local deer came around during the day, this time to find a strange contraption in the front yard and a strange blonde girl making noises with it. They were intrigued and proceeded to nonchalantly forage for greenery in close proximity to the rehearsal, occasionally stopping to look and listen to the music—or to stare at Chloe, who knows? And, of course, from a discreet distance (but closer than you might think) I quietly shot footage of the deer with Chloe in the background who was sometimes playing and sometimes turned on her bench trying to commune with her unusual audience. That night another snow storm was due and we set my plan into play. I set up a couple of discreet spotlights so that once night fell, the surrounding forest would be slightly discernible in what would otherwise have been a pitch black background. We covered the piano with candles which were to be the primary source of light at the piano. Then we ran an electrical cord out to the piano and plugged in a small electric heater under the bench. Later that night as it started to snow, Chloe bundled up again and with one camera on a tripod operated by our neighbor and another handheld by myself, I shot Chloe’s first “public performance” of “Close to You” in the middle of a snowstorm. 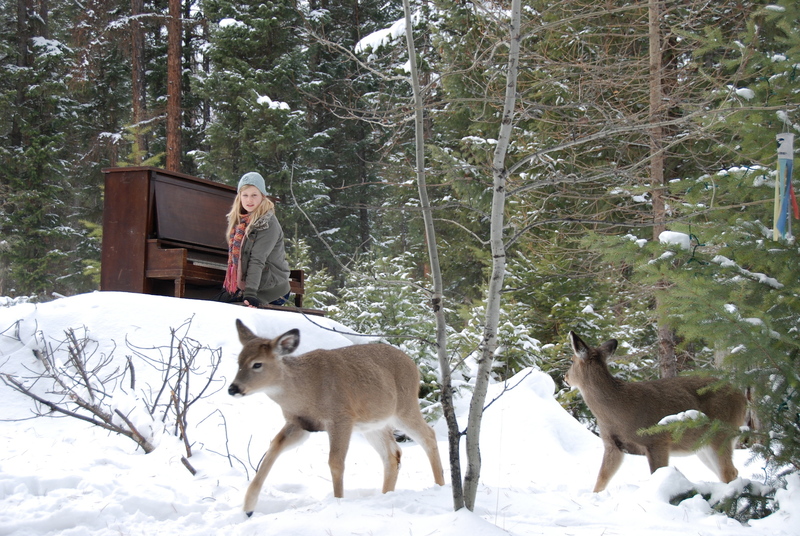 The next day I edited it intercutting some of the day rehearsal shots of the deer “audience” and wound up with a very unique and magical music video indeed. A few weeks later we had some guests over to dinner. Naturally Laury had me show them the video, so I started it for them and left the room. I came back toward the end of the song just in time to overhear one of them say “…Video Whisperer” I have no idea what the rest of the context was. That’s all I heard. And I thought to myself, “That’s it! Perfect!”. I immediately logged onto my computer to see if anyone had that domain name. No one did. So I bought it and everything related. And that’s where the name “Video Whisperer” comes from. Now, why tell this story here? I came from the school of thought that camerawork should be “invisible”. In other words, the camera has a job do to and that job, that purpose, that mission, that contract, is to direct people’s attention into the story being told; to engage the audience’s attention and emotions with the greatest possible impact or clarity. You can get away with “fancy camerawork” (cranes, dollies, hand-held, etc. ), but the moment you do it to call attention to your own camera skills, the moment you’ve distracted the audience into the technique that’s being employed in the story-telling, is the moment you’ve violated that contract. There is a reason for any type of camera composition, still or moving, and indeed there is a purpose to composition—still or moving—in the first place; it all has to do with forwarding a message and directing the audience’s attention to that message with emotional impact. Veteran professional cameramen do this intuitively. To the film making professionals, the camera (or lighting, sound, sets, props, actors, costumes, makeup, directing, editing, script writing, special effects, sound recording and music) are all tools that are used together for that purpose alone. And to the degree that all these departments align to that purpose, there is a potential for a great film. On the other hand you have those who do “fancy” camerawork for the sake of fancy camerawork. They shout “look at me!”. And when someone does that at a party, if you’re a charitable person you satisfy their narcissistic vanity out of politeness, or you quietly leave the room. In my humble opinion, you’ll find that a whisper can be far more powerful than a shout. Just made up that term. Wonder if it will stick. As a 30 year career cameraman, I thought I’d share a few thoughts on camerawork for the one-man-band videographers and small video production companies out there. It’s a many-faceted subject, but like any subject, it has fundamental rules. And while this isn’t meant to be a dissertation on the rules, I thought I mention one that probably isn’t written anywhere anyway as a foundation for my comments, and that is: the purpose of camerawork is to forward the message of the script or production (and that goes for every other department–sets, props, costumes, make-up, lighting, sound, music, editing, etc.). The corollary might be: The purpose of camerawork isn’t to call attention to the camera or cameraman. That said, there are probably few camera support systems I haven’t extensively used in both film and video production–from geared heads, the most expensive fluid heads and tripods, dollies, cranes, camera cars and steadicam. But I used them toward contributing to the overall message of the scene. In the mid-90s I changed over to video, traveling the world in small teams of 2 or 3, self included, with an 18 pound Sony Betacam. The work was fast and often “ninja style”. Little preps, lots of thinking on one’s feet. My biggest impediment annoyance? Tripods. So early on I ditched that $7,000 carbon fiber tripod with the Sachler head for everything except sit-down interviews and I learned to do everything hand-held. Not “shakey-cam”, just a nice, steady hand-held. I’d prop that big Sony on my foot, on the ground, on a ledge, on my knee, hip or shoulder, lean against a pole or fence or building or sit it on a small bean bag I carried and shot stuff that few ever realized was hand-held. But the main point was, I was able to shoot un-impeded. I didn’t miss those fleeting shots on location because I was setting up a tripod and introverted into my equipment. Then came the digital revolution. And now most of the cameras we used have built-in stabilization and most of the editing programs we use have camera stabilizer programs to boot. Better still, the cameras themselves are light-weight with rotatable flip-out monitor screens. What more can you ask for?! Ok, so now let’s re-visit that fundamental above about the purpose of camerawork. Camerawork (or lighting or editing or any of those other departments mentioned) is good when it involves the audience in the story; when it helps to impart mood or emotion or direct attention. And, (corollary), these things are bad when they call attention to themselves, or worse when they call attention to the operator showing off his technical prowess. In fact my view regarding camerawork had always been that it’s best when it’s “invisible”–when it seamlessly becomes the eye of the audience. That doesn’t necessarily mean perfect camerawork. It just means appropriate to and not distracting from the message. It’s quite alright if someone after the show remarks that the cinematography was excellent, but by that they generally mean that everything contributed to the message or story and they were wowed by it all, not distracted or knocked out of the show by it. Don’t be fooled into the notion that to appear “professional” you’ve got to have all these cool rigs and techniques. You don’t even need it to impart a “cinematic” look. Think about all the lost opportunities to catch snippets of life and reaction at a wedding or great B roll of people working at their jobs in the office or on an industrial site while you were busy setting up that fancy shot. Instead keep your attention outward. Be invisible. Catch the stuff that only happens when no one thinks you’re watching. Get your technical expertise up as high as you can get it without losing site of why you’re there. I’m not saying get rid of all your cool stuff and I’m not saying don’t buy it. Just don’t get the notion that you need it to be professional. Far more important is obtaining total command over your camera so that it becomes an extension of your eye which is always outward looking, and then with it you capture what you came for better than your client ever expected. Message is senior to technical rendition. In fact it trumps it. If you capture something in a way that screams the message or mood or emotion, it will resonate with the audience even if faulty. They didn’t come there to watch and critique your camerawork or technique (unless that’s what your video message is about!). I’ve been wanting to do some tutorial videos for a long time. Finally was able to get one done. This one is on lighting for video. I, like many in the video production field, follow a number of different blogs on the subject of video and marketing. If you’ve been there, you’ve seen the periodic rants from “professionals” about amateurs coming into the arena with cut prices and little talent with further rants about how the general business public are tolerating amateur video quality. Like in politics, there’s a grain of truth in that. And like politics, there are very few professionals left. In politics they used to be called “Statesmen”. And true statesmen never bothered too much with the general rants of press and opposition. They’d just get on with the job and improve things, educate and lead people by example. One of the untruths is that the general business public accept low quality. They don’t. Just low quality businesses do. And who wants them for clients anyway? So maybe there’d be some benefit in providing some real practical knowledge so that those current amateurs (aspiring professionals) can learn a few of the basic conventions that have evolved over the past 100 years or so which form the bedrock of what makes a quality film or video that people will actually want to watch. Part One is below. Part Two can be found here. I understood that clearly one day when I was composing a shot for a film. The scene had one person in a large room who was going a bit batty at the moment and about to storm out a door at the edge of the frame, but in the last moment just stopped and banged his head against it. I walked up to the un-manned camera during a rehearsal and discovered one of those happy accidents; the idle camera was composed so that the actor was at the extreme right of the frame, seeming to be leaning against the edge of the camera frame itself, the door frame just visible. It was a wildly “mis-composed” and unbalanced shot, yet somehow it seemed perfect. I quickly realized why: the entire message of the shot was one of un-balance and mis-composure. So that’s how I shot it. A lone figure at the extreme edge of the camera frame, with a huge empty room behind him. It violated all the “rules”, but then what are the rules of composition about in the first place. That’s right--forwarding a message. I was reminded of this recently by noticing a seeming trend in some wedding videography: Tilting the camera. Actually, it’s a technique that was developed in the early days of movie making, probably popularized by directors like Hitchcock and was called a “Dutch tilt”. It was generally used to forward a message of severe emotional instability. So what’s it doing in a wedding video?! Well, that’s an example of gimmick or fad or trend trumping message. Which is the same as not really knowing that the entire purpose of composition in the first place is the forwarding of a message. It’s just one of those pesky little rock bottom basic fundamentals in the field of art.